The North Face makes some of the best rain jackets for the money, but which model is the best? We’ve compared The North Face Resolve 2 vs Venture 2 rain jackets to find out. Having a rain jacket for hiking, biking, camping, or travel is a must. But you can’t always spend a fortune to get the top of the line models. Thankfully, there are a few brands out there that fit well into a budget without sacrificing quality. The Resolve 2 is one of the best budget rain jackets. The Venture 2 is more waterproof and breathable. If you want a lightweight rain jacket that fits your style without breaking the bank, both the The North Face Resolve and Venture rain jackets are a great value. That said there are some key differences between the jackets, so be sure to read up on The North Face Resolve vs Venture comparison below. What’s the Best Budget Rain Jacket? If you’re looking for the best rain jacket, there are numerous brands and great jacket to choose from. They all have similar features, like waterproof and breathable materials, adjustable hems and cuffs, plus decent hoods to keep you dry. However, if you are on a budget, one of the top brands out there is The North Face. They make excellent rain gear without draining your bank account. If you’re going to look at rain jackets, the best way to find the best is by comparing similar models, even within a certain brand. For The North Face rain jacket comparison, we’ve chosen The North Face Resolve 2 Jacket vs The North Face Venture 2 Jacket. Both are quality models with great features, and neither costs more than $150.00. Just a quick note: Both of these jackets have been updated and now have the name of the second version, but they are often still referred to as the Resolve or Venture. If you want the best lightweight rain jacket for travel, outdoor activities, or for running errands, you’ll have a decent choice when checking out the North Face Resolve vs Venture rain jackets. The Resolve 2 weighs only 1.08 lbs, while the North Face Venture 2 weight is a bit lighter at only 0.73 lbs. A tight jacket restricts your movement, no matter what type of activity you’re spending your time on. Both the Resolve 2 and the Venture 2 have a relaxed fit. This gives you a bit of extra room around the shoulders and the waist to help you move more naturally, without looking baggy and unattractive. For materials, the Resolve 2 hiking rain jacket uses nylon material for the shell, with 40D polyester mesh lining on the body and 75D polyester taffeta inside the sleeves and the hood for a bit of extra comfort. These materials are quite strong, resisting abrasions and tears. The Venture 2 adds a bit of extra durability to its material, using 40D nylon ripstop for the shell, which resists tears, but also keeps any your jacket does sustain from spreading. 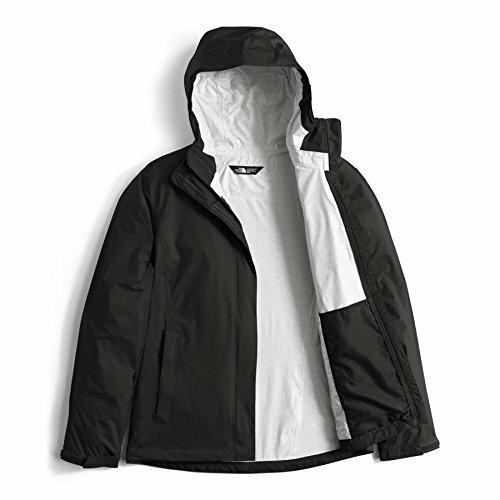 The Heathered colors use 70D nylon ripstop, making it an extremely tough rain jacket for the money. Both of the North Face jackets reviewed here have similar features for waterproofing and breathability. This is The North Face’s Dryvent technology, which uses a polyurethane coating. This PU coating is made of a multi-layer formula that won’t absorb water, keeping your coat dry. It also increases the strength of the rain jacket. The difference between the Resolve 2 and the Venture 2 is the layering. The Resolve is a 2-layer model, which keeps you as dry on the outside but won’t be quite as breathable on the inside. The Venture 2 is a 2.5-layer jacket, which allows more air to pass through if you get a bit warm inside it. This makes the Venture 2 a more breathable rain jacket. When comparing The North Face Resolve vs Venture jackets, you will only find one main difference in the pockets. Both of them are covered hand pockets, with zippers to keep the contents dry when you’re hands are out of them. But the pocket of the Venture 2 also doubles as a stuff sack, making it easy to pack your jacket inside it for a smaller package for travel. For the hem, both the Resolve and the Venture rain jackets use a cinch-cord for tightening it as needed. This makes it easy to lock out the cold air and moisture for a warmer coat. For the cuffs, The North Face Resolve jacket has elastic around them, for a tight fit that blocks the air out all on its own. The North Face Venture jacket replaces the elastic with an adjustable Velcro cuff. This allows you to tighten or loosen it as needed, depending on your wrist size. A rain jacket is no good if it has no hood to keep the water off your head. The Resolve has an adjustable hood that you can tighten around your face as needed to keep the water and wind out. It also rolls up and stows in the collar of the rain jacket when the rain stops. The Venture 2’s hood is also adjustable at the front with a cinch-cord but has a second one to tighten it around the sides as well. This allows you to leave room for a helmet or an extra layer or two beneath it, or cinch it tight against your bare head in damp, but warmer, temperatures. When choosing the North Face Resolve 2 or Venture 2 rain jacket, there are a number of sizes to choose from in both their men’s or women’s models. 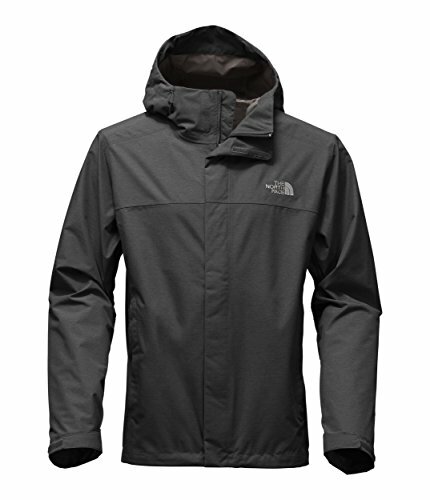 For The North Face Resolve men’s jacket, the sizes include x-small, small, medium, large, x-large, 2XL, 3XL, and 4XL. The women’s’ Resolve 2 has the same sizes, up to 2XL, but no 3 or 4XL sizes. The men’s Venture 2 has the same sizes as the men’s Resolve 2, with the exception of the 4XL, which is not available. The women’s Venture jacket has the exact same sizes as the men’s version of this model, from the x-small size up to the 3XL. Though a color usually won’t make or break a rain jacket, having a variety to choose from lets you pick the right one to meet your personal style. The Resolve 2 comes in 7 colors for the men, including black, red, and blue. The women have 8 colors to choose from, most of which are lighter, like pink and purple, though there are a few darker options. The North Face Venture rain jacket has 11 different colors in their men’s model. The women have only 7 colors in theirs but still shouldn’t have any trouble picking a favorite. When you compare The North Face jackets, you may notice a few differences in terms of features. The Resolve 2 has a Velcro stormflap that covers the front zipper for extra moisture protection. There is a high collar as well, to protect your neck with or without the hood on. The material is also completely windproof for extra comfort. The Venture 2 has a bit more to offer in this area. It also has the Velcro stormflap over the front zipper and windproof fabric. But it also adds pit-zips for a bit of extra ventilation if you start to sweat, and the stuff-sack/pocket to make it a much more packable rain jacket. The North Face began in San Francisco’s North Beach area by two hiking enthusiasts in 1966. They used their love of the outdoors to create a small mountaineering retail store. They started with climbing and backpacking gear and then moved into skiwear over a decade later. In the 90’s, they added sportswear, with clothing at first, and then trail and trekking shoes not long after. With more than 50 years of manufacturing experience under their belt, The North Face continues to push the boundaries of both the gear they make and the exploration of the world. But they have never sacrificed quality to meet these goals. 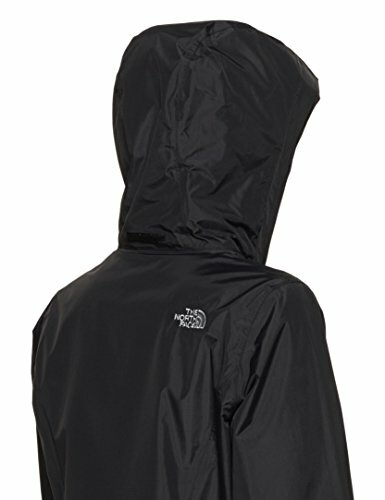 Where Are the North Face Rain Jackets Made? Though some of its products are made entirely in the United States, The North Face still gets some supplies and manufacturers many of its products in both Asia and Central America. What is The North Face’s Warranty? The North Face has a lifetime warranty on all of its products, which covers defects in both the materials and the workmanship. If a product fails to due to these issues, it will be repaired if possible, or replaced, no matter how long you’ve had it. This warranty does not cover damage caused by normal wear and tear, improper use, or negligence on the part of the user. Going outside in the spring, summer, and fall means you’ll be dealing with damp weather at times. If you’re spending days on the trail or at a campsite, you’re going to need a decent rain jacket to keep you dry and comfortable. But you also need one for those unexpected showers while you’re running errands or walking to and from work. The type of rain jacket you choose will reflect the way you’re going to use it. A lightweight rain jacket is good for hiking or biking. For trekking or more rugged activities, a jacket with heavier, more durable materials is a must. There are also ultralight rain jackets, which are great for the minimalist who needs something extra small to pack, though these lack the features on other models. Before you buy, consider where and when you’ll be using your rain jacket to ensure you have made the right choice. When it comes to layers, there are three jacket types to choose from: 2-layer, 2.5-layer, and 3-layer. A 2-layer is pretty basic, with a mesh liner underneath the outer shell. These are bulky and not very breathable, though cheap to buy. A 2.5-layer jacket replaces the mesh with a thick interior fabric. They breathe more easily, but are also lighter and more compressible, making them the best models for hikers and climbers. A 3-layer rain jacket has the outer shell, the thick inner fabric, plus adds a waterproof and breathable layer in between. They are a bit heavier than a 2.5-layer, but are much stronger with increased breathability. As for material, nylon and polyester are the most common. But these can be upgraded to ripstop or ballistic versions to resist abrasions and reduce tearing. As we explained above, breathability depends on the layering of your coat. Some types are more breathable than others, depending on the materials used to create the layers. The reason you want a rain jacket to be breathable is that you are likely to sweat if you’re exerting yourself during a hike, a bike ride, or a walk. The material allows the heat and moisture inside to escape, instead of collecting it and soaking you beneath your coat. Even though they claim to be waterproof, most rain jackets are actually water-resistant. This means they will repel water in light to moderate conditions, but may not be able to keep you dry in a heavy downpour. But there are ways a jacket can help reduce the water that gets through. The waterproof shell and inner layers are a must. But they can also add fully sealed seams to keep the water out of any stitched areas. Stormflaps also protect the zippered areas as well, reducing leaks for a drier day. When comparing The North Face Resolve vs Venture rain jackets, both of them had a regular fit. This is quite common in rain jackets to keep the jacket a bit loose and encourage layering underneath it. This also keeps it from constricting your arms and shoulders, giving you a wide range of motion. If the coat is too tight or just fits over a t-shirt, get a bigger size, just in case you need a sweater or another thicker layer under it. When you’re hiking, backpacking, or climbing, you need a rain jacket that won’t add to much weight, especially if you’re carrying a backpack full of gear. Most rain jackets, like the Resolve 2 and Venture 2, are lightweight and easy to carry, on your back or in your pack. 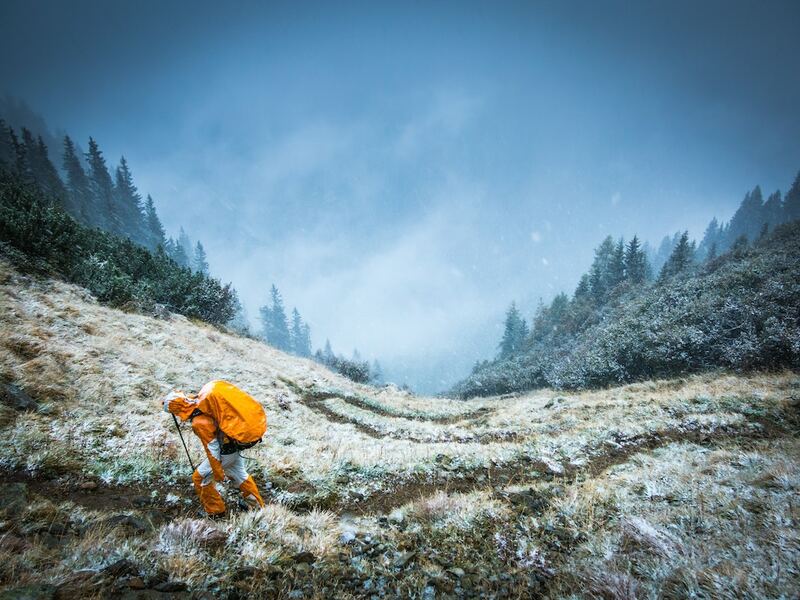 The materials and layering also have to do with the weight, so be sure to check these features out in order to get the lightest rain jacket you can. Compressibility isn’t important if you are only using your rain jacket to run errands or to keep you dry on your way to work. But if you are going to be carrying it with you, this is a necessary feature. The best travel rain jacket will not only be lightweight, but compressible. Many of them can even be stuffed into their own pocket and hung from a carabiner to make carrying a rain jacket with you even easier. 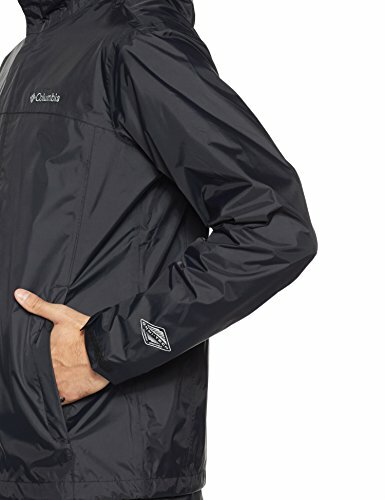 Not every rain jacket will have pockets, but those that do usually go with zippered hand pockets. There may also be a chest pocket, and maybe even an inner one, though this is rare. Rain jackets are meant to be small and light and too many pockets will counter this. For cuffs, there are a few types to choose from. Elastic cuffs are fine, but can’t be adjusted for a more comfortable fit. There are also Velcro cuffs which can be tightened or loosened as needed for the right fit and to keep the water and cool air out. Hoods are a must on a rain jacket, or the water will pour over your head and right down your neck. Most rain jacket hoods have adjustable cinch-cords at the front to tighten it around your face. Some also include adjustments at the back and sides to cinch it down around your whole head for a tighter fit. There are also larger hoods that are meant to fit over helmets or other layers, like hats or sweatshirt hoods. But they are not for everyone, so try the hood on with and without those layers to see what feels most comfortable for you. There are a few other features you can look for in a decent hooded rain jacket to ensure it is the best you can get on a budget. Most of them have hem adjustments, which allow you to tighten the jacket at the bottom. This blocks out the wind and moisture. Pit-zips are also a good feature to keep you comfortable. If you start to overheat in your rain jacket, you can open them up to give you some much-needed ventilation. And when you start to feel a chill, you can zip them back up again. Taped seams and stormflaps keep the wind and rain out of those areas that could otherwise leak. Stowable hoods that pack into the collar are handy to keep them out of the way when you don’t need them. Chin guards keep you safe from pinching zippers. The North Face has long been making some of the best outdoor clothing and the Resolve 2 and Venture 2 rain jackets are no exception. Not to mention they make some of the most budget friendly gear out there. When comparing the The North Face Venture 2 vs Resolve 2, both are excellent choices for a lightweight, do-it-all rain jacket. However, there are some factors that may make one of these jackets more suitable for you than the other. The North Face Resolve 2 costs a bit less, has more sizes to choose from, and has that handy stowable hood. However, there are a few features it lacks that are found on the Venture 2. This includes the pit-zips, the stuff sack pocket, and the extra hood adjustments. The North Face Venture 2 is also a lighter in weight, a bit more breathable, and has more color options in their men’s model. If you really need to pinch those pennies, the Resolve 2 is still a great jacket. But if you can manage an extra $30.00 or so, the Venture 2 has a bit more to offer.